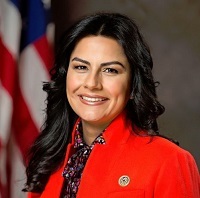 Nanette Diaz Barragán was elected to the U.S. House of Representatives in November 2016, becoming the first Latina ever to represent California’s 44th Congressional district. Born in Harbor City and growing up in its surrounding harbor communities, Nanette’s humble beginnings shaped her interest in issues that matter locally: environmental and health justice, immigration reform, strengthening the economy, and affordable and accessible education. As the youngest of eleven children raised by immigrant parents from Mexico, Nanette knows about the challenges that many low-income minority families face firsthand. Her father, a local repairman, instilled in her a strong work ethic and influenced her love for baseball (in particular, for the Los Angeles Dodgers). Her mother, who only completed the 3rd grade, cleaned homes, cared for others, and worked in factories to make ends meet. Nanette learned from her parents values of hard work, and obtained her undergraduate degree from UCLA and her Juris Doctor from USC Gould School of Law. With a desire to give back to her communities, in the late 1990s Nanette began her career in public service. She steered outreach efforts for African Americans in the Office of Public Liaison for the Clinton White House and worked for the National Association for the Advancement of Colored People (NAACP) focusing on racial health disparities and discrimination. Nanette was the first woman in 12 years to be elected to the Hermosa Beach City Council, and was then elected by her peers as the first-ever Latina to serve as Mayor of the beach city. During her two-year term on the city council, Nanette was a strong advocate for environmental justice – she successfully stood up to a powerful oil company and stopped a proposal to drill 34 oil and water injection wells in Hermosa Beach and out into the Santa Monica Bay. Nanette served as an extern to Justice Carlos Moreno of the Supreme Court of California and, at the Los Angeles Legal Aid Foundation, she fought for justice for low-income families. In 2016, Nanette decided to take her advocacy to the national level. She ran to represent her neighbors, friends, and family members in Congress, with a focus on bringing change and opportunities for those who need it most. In the 115th Congress, Nanette was elected by her peers to serve as the freshman class president as well as a regional whip, working with her colleagues and reporting back to leadership their thoughts on legislation. Nanette also is member of the Congressional Hispanic Caucus, the Progressive Caucus, and serves on the Homeland Security Committee (https://homeland.house.gov) and Natural Resources Committee (https://naturalresources.house.gov).